You are here: > Home > Blog > What Are Energy Storage Systems? Lead acid batteries have traditionally been the energy storage product for emergency back-up power solutions. They are a tried and tested technology, developed in 1859 by French physician Gasyon Plante, with lead plates (positive and negative) and hydrochloric acid electrolyte solution or gel. In simple terms electros flow between the plates creating electricity. Whilst lead acid battery technology has been developed to improve their operating efficiency and recycling characteristics, the technology does not lend itself to fast recharging (typically 8-16 hours) and can suffer performance and capacity degradation, loss of electrolyte, sulfation and general ageing with a typical design life of either five or ten years. Valve Regulated Lead Acid (VRLA) batteries are the principle energy storage product used within Uninterruptible Power Supplies (UPS). During normal operation, the battery set is charged by the UPS rectifier. When the mains power fails or becomes unstable and falls outside the input voltage window of the UPS system, the battery set is used to power the output inverter and keep the load running. Worldwide demand for lead acid batteries and the volume produced, means that the lead acid battery technology is going to be hard to replace based purely on cost. VRLA batteries are relatively cheap to manufacture and recycle. Is there an alternative battery type for emergency backup? There is and it is one commonly used in consumer electronic devices and laptops. Lithium-ion batteries have a recharge and cycling advantage over lead acid. Lithium-ion are high cycle-rate batteries that are fast to recharge. The problem for their use in large scale backup systems such as uninterruptible power supplies is their cost and the need for a more sophisticated charger control and balancing system to prevent catastrophic thermal runaway. Fuel cells were originally developed as part of the space program and there are several types. Whereas a battery is a self-contained power pack, a fuel cell consists of a mechanism that reacts hydrogen and oxygen to generate electricity with water as a side product. The problem can be one of start-up based on the temperature the device needs to reach in order to operate. Hydrogen is the primary fuel source and a supply must be connected to the fuel cell for it to operate. In terms of fuel cell technologies, the Proton Exchange Membrane (PEM) Fuel Cells (PEMFC) type is leading the field as a solution for transportation, portable and stationery energy generation as it has a lower temperature and pressure range (50-100degreesC) than other types. The issue for fuel cells in power back up applications is that so far there are few options that are truly scalable and cost comparative. Some fuel cells can be stacked in parallel to scale them and the top end appears to be around 20kW. 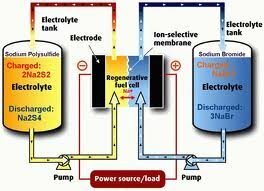 Flow batteries are similar to fuel cells in that the systems include a conversion component and external fuel sources. Flow batteries are considered for larger applications and at the grid level to help stabilise electricity supplies. A typical flow battery system is the Vanadium Redox Flow Battery (VRFB). The technology uses a vanadium electrolyte separated by an ion exchange membrane. Flow battery systems can scale up to several MegaWatts (MW). Compressed air storage is a medium-sized solution that sits between fuel cells and flow batteries. The best way to think of this technology is as a combination uninterruptible power and generator. The critical load is powered from the UPS inverter output and this is supplied a source of DC power from a generator that is compressed air driven. It is hard to say at this stage which of these three technologies will still be around in the years to come but all indications are that lithium-ion and fuel cell technologies will become the standard for a wider range of applications than flow batteries or compressed air storage systems. Lithium-ion is becoming the standard for electric vehicles and charging points are appearing up and down motorways across the US, UK and Europe. Whether fuel cells will replace lead acid batteries for emergency back-up power and energy storage will depend on how close to parity pricing can be driven for a wider range of sizes from several kW to MWs. In my view this depends on fuel cell pricing being subsidised to allow manufacturing volumes to rapidly increase, financial incentives from government and the overcoming of a reluctance to store hydrogen on or near to critical sites such as datacentres.